Leaves for Trees: Tuesday's Tip - Google Friend Connect is moot...now what? Tuesday's Tip - Google Friend Connect is moot...now what? One of my favorite aspects of Blogger was the Follower function. You know, all the small pictures of friends and readers of your blog. I enjoyed watching my readers grow as I put more and more effort in to my blog. I paid more attention to my Followers than the actual page views! The other thing I loved about Google Friend Connect was the ease with which I could follow other blogs. Just click "Join this site" and the blog was populated in my Google Reader. But wait, there is no Google Reader. So what is the point of Friend Connect? The fact that I'm following other blogs is listed on my profile and blog posts from the blogs I follow are listed on my Blogger homepage, but now that Reader is gone, they are no where else. I made this sad realization just the other day when I clicked to join a new site and realized that it sure wasn't going to start showing up in my Feedly reader! So I started digging. It appears that in an effort to drive people to Google +, the Google team has now put together a Google + Followers option that merges your Blogger profile with your Google + profile. Your blog posts will automatically be listed on your Google + page. 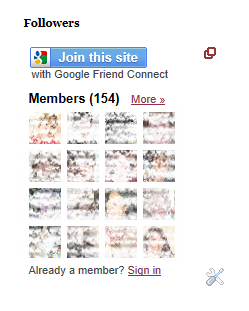 The point is that it merges your Google + and Blogger followers so that you no longer need to manage two sets of friends. Next problem? I don't use Google +. To me it's a weak version of Facebook (at this point) and not many of my friends use it. However, if Google + is your main social networking tool, it is a no brainer to merge your profiles to make it easier to share blog posts with your friends and family. For now I'm going to keep my Google Friend Connect widget. For the good times. What will you decide? To find out more about Google + Followers check this out. And for more information about merging your Google + and Blogger profiles, see here. Great information Heather! I don't use Google+ either, so came to the same conclusion as you and I'm keeping the Google Friend Connect widget for now. You can still bring up your Reading List in Blogger which gives you links to your followers' blogs and to their current posts. I use that sometimes instead of bringing up Feedly. Heather, a correction to my previous comment is that Blogger's Reading List shows blogs you've followed (not those who have followed you). I do use Google+, mostly for genealogy (of course!). If you ever do combine your Google+ and Blogger profiles, many things combine, including the ability (unless you stop it) for people to comment from either location on your post. Just another thing I learned! I've always just used the Blogger's Reading List so the transition has been seamless to me. I guess I'm happy that I never advanced from that option but I probably should think about something else. Kathryn, yes, I'll keep it for now. I'm just not a big fan of Google+ so I doubt I'll switch to it. I don't have time to keep up Facebook and Google+! Nancy, change is hard! It seems that in these days of technology, nothing stays the same...except for maybe taxes. Sally, a very good point. I came across of couple of folks that had made the same mistake. I imagine that Google will force us to do so at some point so it's good to investigate now! Debi, I have never even looked at the Google Reading List! On my blog home page it only ever shows posts from the Google blog so I never investigated it further. I think I should now!